While Apple is content to keep its laptop and tablet hardware separate, Windows PC manufacturers seem determined to bring them together. While Apple has taken flak for the lack of a touch screen on its laptops, it finally threw its customers a bone and put a small touch screen in place of the top row of keys on the latest Macbook Pro. Have you taken a look at Windows PC laptops lately? The majority seem to have a touch screen because Windows 10 was designed to take advantage of the touch interface. 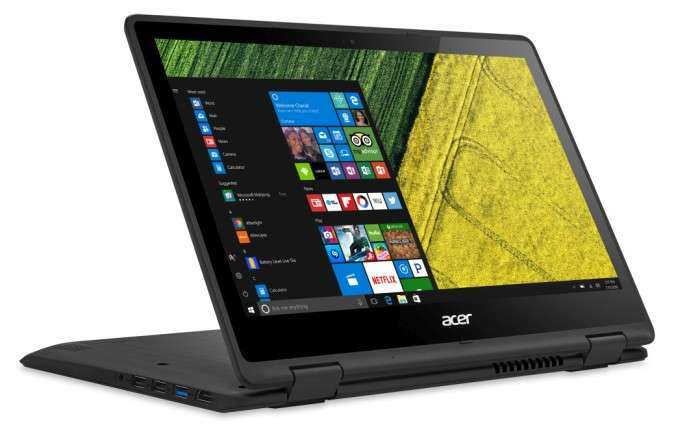 I've been using the Acer Spin 3 ($649.99). With its 15.6-inch screen, it is the largest of the new Spin line of touch-screen notebooks. The Spin laptops all have a touch screen and a 360-degree hinge, which enables the screen to bend all the way around so you can use it like a tablet or in any of several different configurations. Bending the hinge around most of the way lets you the user prop up the screen like a tent for better movie-watching or for small presentations. The Spin 3 runs Windows 10, and its wide body has enough room for a full-size backlit keyboard with a full number pad. My review model had 12 gigabytes of RAM, a one-terabyte hard drive and a 2.5 GHz Intel i7 processor. The 15.6-inch display showed full HD, with a resolution of 1920 x 1080 pixels and multi-touch that can distinguish 10 fingers at a time. Communication is handled through 802.11ac Wi-Fi and Bluetooth 4.0. There's a 720p webcam for video conferencing. Ports include one USB 3.0 and two USB 2.0, HDMI out and a headphone jack. The 3,220 milliamp-hour battery can provide up to 8 hours of use. Physically, The Spin 3 is 15.02 inches by 9.88 inches x 0.89 inches and weighs 4.74 pounds. It's not tiny, but it's not supposed to be. The Spin 3 has the size and horsepower to be your only computer. The keyboard was very comfortable to use, although I have to admit, because there's a full number keypad, the QWERTY letter keys are not centered on the body of the laptop so I had to really watch to make sure my fingers were on the right keys. I started typing gibberish more than a few times when I first started using the Spin 3. The 360-degree hinge is very useful and felt very strong. I had no problem with the screen staying in place at every angle. The screen is vivid, and the response of all aspects of the Spin 3 will not disappoint. It's quite peppy. The Spin 3 is a great combination. It's big enough to use comfortably on a desk or in your lap, and when you flip the screen around to use it as a tablet, the 15.6-inch screen is perfect for watching videos, reading or just surfing the internet. I'm reminded of the story of the three bears. There are cheaper laptops and there are smaller laptops, but the Spin 3 is just right. Pros: Fast, big, tablet mode, inexpensive. Cons: The off-center keyboard gave me fits until I got used to it. Bottom line: A good choice for most PC users who want the touch-screen experience.